Wikipedia is one of the most popular apps in the world. It gives users access to a detailed explanation of everything you want to know about. Although Wikipedia is a great site, content on its pages can be lengthy. If you don’t have time to read lengthy educational content, you should use LinkedIn SlideShare app on your smartphone. For those who don’t know, SlideShare is an online presentation sharing service that was launched in 2006. It was acquired by LinkedIn in 2012. SlideShare and LinkedIn are now the subsidiaries of Microsoft Corporation. SS is a great source of knowledge. According to its parent company i.e. LinkedIn, SlideShare gives you free access to over 15 million slideshows and has around 70 million users. Although this app is not integrated with LinkedIn, Microsoft has changed its name from SlideShare to LinkedIn SlideShare. SlideShare is a 10-megabyte app that requires account registration. It also lets users log in with their Facebook or Linked IN account. Registering a new account is easy with SS. Unlike other apps that ask you to enter a name, age, etc, SlideShare will request you to enter an email address, password and verify your email ID. The first thing that users see after logging in for the 1st time is an interface that boasts a list of topics. You must select the topics you find interesting. When you do so, SlideShare will only display the slides that are related to the topics you have followed. There’s no limit on the number of categories you can follow. 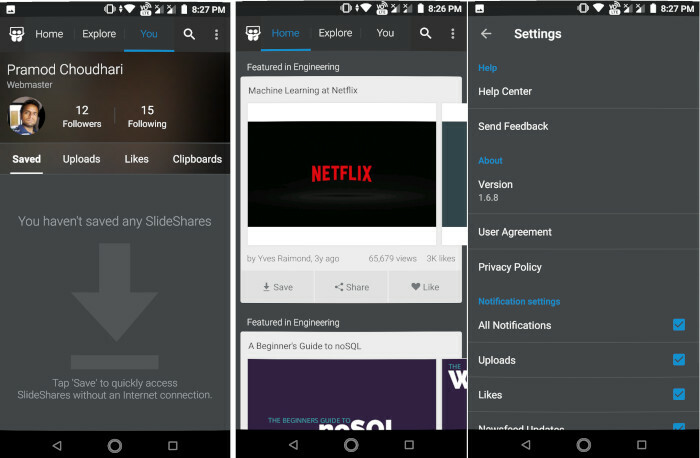 Home: SS displays a list of most popular and most viewed slideshows in its home tab. To open the next slide, swipe right and to open the previous, swipe left. SlideShare displays the name of the author, the estimated length of the slideshow, the number of times the presentation has been seen and the number of likes it has got. SS lets users save the slideshow for later reading. It also has the option to share the slideshows on social media networks. Explore: This section enables you to find interesting slideshows from topics you’ve not subscribed to. You: Here you’ll see the number of people that are following you, the count of SlideShare users you are following, list of slides you’ve saved, slideshows you have uploaded, etc. Search: SlideShare provides a search tool with which you can find slides containing certain words. What did I about the app? Even tough SS lets users follow other users, I’d like to see an option to rate slideshows in it. This is because anyone using SlideShare can upload a presentation. A student may go through slideshow which has been uploaded by someone who doesn’t have good knowledge of the topic. Conclusion: SlideShare is a powerful slideshow sharing application. It helps users in learning complex things quickly.